Every year, World Book Day gets bigger and bigger. This year, it became an entire week! I was honoured to take part in a special video made by The Guardian to celebrate the occasion. Along with my fellow authors Jacqueline Wilson and Jim Smith, I was interviewed by a reader dressed as a character from my books: in my case, Varjak Paw! The video is here and is absolutely fantastic; there's also a full transcript of the interview that you can read here. On World Book Day itself, I visited Montem Primary School in Islington, and talked to Years 6, 5 and 4. It was inspiring to see so much enthusiasm for books and reading – and I was delighted to see a tiger on the way out of the school, because the new book that I'm working on is called TYGER! 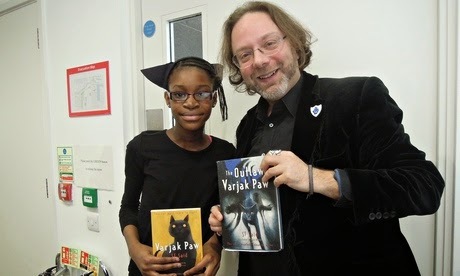 Finally, I visited Friars Primary School in Waterloo, where I met Years 6 and 5, many of whom had read both Varjak Paw and The Outlaw Varjak Paw, and some of whom I understand are now reading Phoenix! I hope you all enjoy it... and I hope that everyone I met had a totally brilliant World Book Week!